After a month of thrilling, nail-biting, tension-filled soccer, we finally have the two teams who will take the field at Maracanã hoping to lift the trophy and bring joy to everyone in their country. It has been a long and impressive road for both final competitors and now France and Croatia are set to lock horns in a match that has all the elements of a World Cup classic. 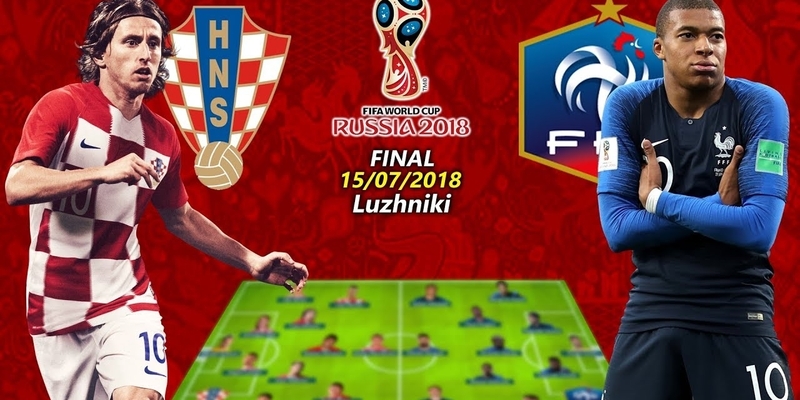 The French are looking to finish something that they have started with a Fusion of talented youngsters and experienced players, Whereas, the Croats are determined to take the title in no pressure having reached their first ever FIFA World Cup. France are coming off a grueling Semi final against Belgium where a solitary strike from defender Samuel Umtiti was enough to put them through against Pre tournament favourites. This will be their second appearance in the World Cup final. They are hoping to win their second World Cup title. On the other side, Croatia will be making their first appearance in a World Cup Final. To get to this one, they had to slog through three extremely tight knockout games, all of them enduring the 30 minute extra time. On paper France has the better team, starred by a galaxy of Stars. Coach Didier Deschamps use a highly flexible and mobile formation which is one of their main weapons when counter attacking at speed. Kylian Mbappe and Matuidi provide the pace and power on the flanks, alongside frontman Olivier Giroud. Ngolo Kante, Paul Pogba, and Antoine Griezmann form the central partnership, and are the axis upon which France turn. They cover for each other and work in telepathic tandem and provide the team with a great energy as they attack and defend as a unit. Croatia coach Zlatko Dalic has shown a great understanding of not only the opposition, but of his own team’s strengths too. They have shown a great ability to break quickly, absorb attacks, and control the space on the pitch in their third, making them a very tough opponent to figure out. In the tournament, they where one of the teams that had a hundred percent record in the group stages. They have arguably the best midfield duel led by diminutive and versatile captain Luka Modric and Ivan Rakitic alongside Mandzukic upfront. France edges on the two teams’ head to head clashes having claimed 3 wins, while Croatia won 2,There has never been a draw between the two teams. When the two teams met at the 1998 FIFA World Cup, A legendary performance by defender Lilian Thuram, who scored both goals, lifted the hosts into a long-awaited first World Cup final with a 2-1 semifinal victory in Saint-Denis. France overcame a second-half red card to defender Laurent Blanc and went on to win the title. At Euro 2004,David Trezeguet scored the equalizer in the 64th minute to help Les Bleus to a 2-2 draw with Croatia in the second game of the group stage. Croatia never recovered, lost to England in its first-round finale and was eliminated. The French won the group but were upset in the quarterfinals by Greece.